Jupiter Properties Manchester are an independent family run landlord & lettings office in the heart of Fallowfield, Manchester. Having been established in 1985, they have been renting student & professional accommodation for over 30 years. 2: Desks for staff members which had to have drawers for filing and had to be aesthetically pleasing from the visitor side and incorporate a large curved working area. 4: Conference room – need a table with 8-10 chairs that can be dis-assembled. All of the above had to incorporate Jupiter Properties company colours which are blue/white with hint of black and grey. After various discussions we were sent an accurate floor plan of the property which enabled us to draw up a plan of the premises and allowed us to plan accurately using industry software programme pCon the furniture which was required and allowed us to present our proposal of specified furniture. 1: Bienvenue reception desk which offered a suitable contemporary look and is available in different modules with suitable DDA sections and high sections. The desk also can hold suitable literature and literature to parcel shelf on the counter section. The Bienvenue desk is also available in grey amongst other finishes and was available within the required lead time of 7 – 10 days. 2: Ergonomic Osmose desks corner desks with matching desk high pedestals. These desks are suitable for customer facing companies such as estate agents and letting offices as they have a contemporary aluminium leg feature which sets this type of desk apart from its counter parts. The Osmose desk range also comes with matching storage from the C01 range which again is a smart storage solution with many different configuration possibilities. Jupiter properties utilised some storage options from the C01 range including the useful C01 mobile storage unit. 3: The ECT Designer mesh chairs are popular as they are heavy duty yet very stylish as they incorporate a mesh back faux leather seat and ergonomic adjustable headrest. 4: We specified the central table in Wenge for the conference room with Envoy meeting room chairs allowing a functional meeting room space due to the unobtrusive central leg on the table and the well-formed size of the envoy meeting room chairs. 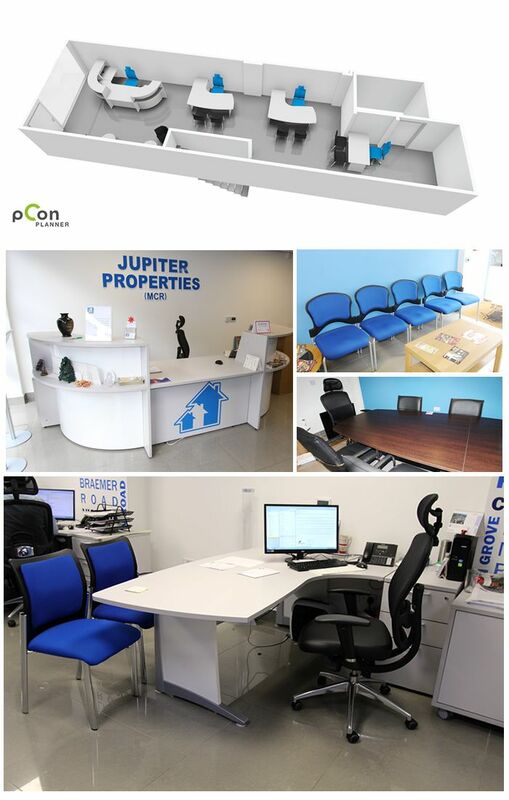 Overall we delivered the furniture on time and on budget and Jupiter properties were really pleased with our specification of furniture, design process, customer services and after sales care that they have used us repeatedly for additional items for their offices. We enjoyed working with Jupiter Properties in getting their new offices up and running. We wish them luck in the future. "The team at Office Reality have been excellent throughout our whole office move. Professional, patient and quick to deal with any queries. I would highly recommend them to any company or individual looking to kit out their offices."